he was not a good son; he was not a good husband; he was not a good dad. When I was young and dependent and inexperienced and innocent and gullible: I adored him. But then, I learned. a dad who hurt his own kids. The cycle MUST END. Right here. Right now. With me. It ends here. Fix me. Chase and pursue those around me. Father God, please be my real Dad and my faithful Husband and I will strive to be the very best daughter and best wife You’ve ever had! (If you read my blog regularly you know I have been struggling – and I am pushing through a lot of “stuff”. I am being brutally honest, with myself, more than anyone and getting better every day!) And, if you are curious about the husband mentioned above, it was not Sharpshooter! 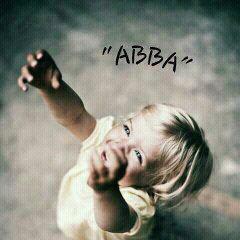 Oh don’t ya just Love that name of his, Abba. Yes, we may and we will let him down, and maybe put a tear in his eyes. But…. He shall never, No Never, let us down. Oh How He Loves Us,,,,,,, He really does. Deep and profound …thank you, Susan. I had a WONDERFUL earthly father and yet when it came to relationships with men made hideously horrible choices. Go figure, huh? Wow Mom thank you for this. It has been my prayer that it stops at me. It is difficult and quite challenging to learn to trust Him for all of everything, in all of life. When a person can figure this out, it is an amazing feat. So for now, I choose love. A good friend of mine spoke on loving freely once and I have pondered on this since. I think this is one of those subjects that speak you are free to love. Hard? Yes. Impossible? No. I have Abba father. The only one that doesn’t disappoint. amen! I pray both your brothers will read this as well. It is time to HEAL & MOVE ON! What a wonderful read, it touched my heart in so many ways. What would we do without our Abba Father? How does one get through life without him? He never fails, never lets us down, is always by our side. One that gives us a relationship that never ends, never fails. Always Faithful to us. Honest with yourself? I’ve never known you to be any other way. You are so honest, in fact, that it has given me the courage to “go and do likewise” many times when I only wanted to tighten the mask that was my covering. I know the “what”, not being honest with oneself. What I need to learn is the “how”, on a consistant basis. My daddy was good to me, I loved him with all my heart while not trying to cover up his faults, and there were many. But daddy is gone. As God said, “Moses, my servant is dead.” At 65+ it’s high time that I more strongly develped my “heavenly DADDY” relationship. Now, as I said, learing the “how” is the tricky part. You are loved, my dear.